Breaking News. Boat US just named New Bern one of the top 10 best cities to retire, play, and thrive. New Bern is quickly becoming known as the place to retire in N.C. Folks from all parts of the country, including Florida, are choosing this beautiful historic city to call home. Why? Keep reading, and we will explore some of the reasons. Since everyone loves the water, lets start with waterways. The Neuse and Trent Rivers converge in historic downtown New Bern. At this point the Neuse River is about 1 mile wide. Two or three miles down river the Neuse is almost 3 miles wide and eventually becomes the widest river in the U.S. The picture on the left is the Gazebo located in Union Point Park in downtown New Bern. Union Point Park is a wonderful place to walk, fish, crab, launch your boat, or just relax. During the warmer months live music can often be heard here. For more information on the Trent and Neuse Rivers click the links below. In addition to the Neuse and Trent River there are numerous deep, winding, fresh water creeks that are great for canoeing, kayaking, fishing, and boating. I know, because I have explored just about all of them. The map above shows 2 more reasons New Bern is rated so highly as a retirement destination. New Bern is only 35 minutes from Atlantic Beach, see red A, and the beautiful Carolina Crystal Coast. The 150,000 acre Croatan National Forest is a great place for fishing, hunting, hiking and exploring. Notice the rather large lakes there. Perfect for Kayaking. Property Taxes in New Bern and the surrounding area are considered reasonable by many that relocate here from other states. Property valuations were last set in 2016. Click the link below for New Bern And the surrounding area property, sales, and income tax information. New Bern has a rich and varied history. Downtown New Bern is one of the finest historic districts in the nation with many beautiful homes dating back to the late 1700s and early 1800s. There are the large and palatial ones with beautiful garden areas as well as small bungalows. The downtown business district has come alive with arts, music, restaurants, and coffee houses. The following links will give you a good insight into the unique history of this beautiful historic river town. 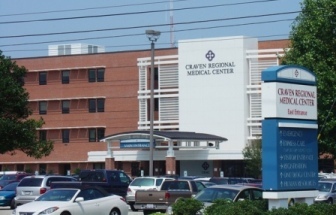 New Bern, has an excellent regional hospital with over 340 beds and 200 physicians. The March issue of Business North Carolina features ���The State���s Top Hospitals��� and CarolinaEast is listed in four categories. The Business North Carolina ���Top 25 Best Hospitals��� saw CarolinaEast tie for fifth place based on criteria from several respected rating agencies including Centers for Medicare and Medicaid Services, Blue Cross and Blue Shield, U.S. News and World Report and The Leafrog Group. Blue Cross and Blue Shield ranked CarolinaEast Medical Center a Cutting-Edge Hospital for Cardiac Care and U.S. News and World Report named CarolinaEast a Top Performing Tar Heel Hospitals regionally for Chronic Obstructive Pulmonary Disease (COPD) and Heart Bypass Surgery. In addition, The Centers for Medicare and Medicaid Services (CMS) released the hospital star ratings on July 27th and CarolinaEast Medical Center is the only hospital east of Interstate 95 to receive the highest rating ��� five stars. Nationwide, only 2% of hospitals achieve the 5 Star Rating. They have a comprehensive heart center that performs coronary bypass and catheterization. In addition, they have dedicated units for cancer, intensive care, women's care, and pediatric care. The diagnostic center provides radiography, MRI, CT scanning, stereotactic mammography, bone densitometry and many other tests. In 2014 Carolina East Hospital announced a collaborative partnership with the University of North Carolina Cancer Center to diagnose and treat cancer right here in New Bern. Construction on the Cancer Center, shown in the photo above, will begin in early 2017. UNC will now be rotating some of their best cancer doctors to New Bern to treat patients here. Now you will be able to get world class oncology care without leaving New Bern. Click Here to learn more about Carolina East Hospital. Need help finding a physician? Call Physician finder 252-633-8102. New Bern has an exceptional regional airport with 3 direct flights daily to Atlanta and 7 direct flights daily to Charlotte. From these 2 airports you can can make it to your destination with one flight most of the time. The Airport is located about 3 miles from Historic Downtown New Bern. A few years ago New Bern's Airport was named one of the Top 10 stress free Airports in the U.S.
Click on the Airplane to get information on flights to and from New Bern. Located just across the Trent River from downtown it is just minutes away from the many areas of interest in Eastern North Carolina. The New Bern Airport was voted as one of the 10 least stressful Airports in the USA. And after you use it you will understand why. Many of the retirees that have moved to New Bern from other states have brought with them a wide range of interests. As a result, New Bern offers a taste of cultural experiences that you would normally only find in a larger metropolitan area. Whether it is music, theartre, antique cars, quilting, computers, astronomy, bridge, art, whatever your interest might be, you are sure to find others that share your passion. We encourage you to get involved with the many local non-profits, and so very many have. As an example of the 400 volunteers at our hospital, probably over half of them are retirees that have moved here from other states. The bottom line, you won't be bored in New Bern. to see a partial list of clubs, organizations, and non-profits in New Bern and the surrounding areas. New Bern, NC has a plethora of festivals, parades, and assorted activities going on year around. In the Summer and Fall, downtown New Bern comes alive. Music in the park, three very active civic theaters'. The Hilton has live music 3 nights a week. Expect to hear live music every weekend at one of the 6 bars downtown several times a week. There are some really talented musicians in the area that play variety of music. There is always something exciting going on downtown. During the spring, Summer, and Fall there is a monthly Artwalk downtown. New Bern is fast becoming known as the city of artist and the Artwalk gives all of our artist a chance to display their unique work. How is the Weather in New Bern? New Bern has a mild climate with 4 distinct seasons. While summers can be hot, they are probably not much hotter than many areas of the Northeast. If it is 95 degrees here, it is probably close 95 in the D.C. or coastal New York area. Winters are mild and allow for golf, boating, and other outdoor activities pretty much year around. That is not to say that we do not get any freezing weather, however it is infrequent and considered mild by Northeast standards. It is interesting that we get quite a few folks that move here after retiring and moving to Florida. When I ask them why, many times they say that it is to toohot for too long and that Florida lacks nice Spring and Falls. Also, Florida is Hurricane Alley, and I am not talking about mild Hurricanes. We are talking about Cat 4's and Cat 5's. In the history of N.C. we have only been hit with one Cat.4 Hurrican and that was over 60 years ago. New Bern has some great golf courses that are both affordable and challenging. When I am not working or boating, golf is what I like to do. Click the link below to learn more about golf in the New Bern area. If you have any questions shoot me an email. If tennis is your sport, you will not have trouble finding a game in New Bern. The influx of retiree's, many of whom came from large metropolitan areas has significantly added to the cultural awareness of the city. I challenge you to find a more active threatre group in a small Southern town. I don't think you will. Click below to find out more about the threatres in the New Bern area. Add all this up and you will see why New Bern is such a retirement destination. If you have any questions about the area please send me any email at or send me a text at 252 514 9157. Steve and Jana Tyson sold over $50 million of Real Estate in the past 2 years and over $150 million in the past 10 years. The Tyson Group are "Leading The Market, Sign up to Sign Down". New Bern was featured in the July-August 2008 Where To Retire Magazine and the January 2018 edition, one of the leading magazines for retirees that are looking to relocate. Both editions rated New Bern as a top retirement destination. When Dave and Barb Rohrbach retired in New Bern, they were looking for a comfortable home and an interesting town with history. Comfort was found in a new home they built in a suburban golf community, but the history was downtown, where they quickly found themselves part of an American scene that has been unfolding for almost 300 years. As a volunteer with a dedicated green thumb, Barb helps ensure that the magnificent gardens of the Tryon Palace continue to burst into blooms each spring as thousands of visitors come to visit New Bern. Barb 57, and Dave, 61, who lived in Manchester CT, investigated several retirement locales in Florida and the Carolinas before stumbling on New Bern during a trip in August 2002. At the suggestion of a friend they had gone to look at Wilmington, NC, and as they returned they discovered New Bern resting picturesquely on the Neuse and Trent Rivers, its downtown church steeples visible from the bridge on highway 70. The sight prompted an overnight stop, a spontaneous act that changed their lives. Congenial, friendly people and the charm of New Bern's colonial character quickly won them over. In 2003 they bought a home in the suburban Taberna community. Their quiet rural setting is only 10 minutes from downtown New Bern, where three historic districts boast Georgian, neoclassical, federal, and Victorian architecture. Early statesmen, artisans, and business pioneers lived here, and many of the homes in New Bern have been restored as offices, restaurants, and shops. On the corner of Pollock and Middle Streets in historic downtown New Bern is the pharmacy once owned by Caleb Bradham. Here Barb greets customers with, welcome to the birthplace of Pepsi. While growing flowers at Tryon Palace is her volunteer job, Barb works twice a week as a paid "soda jerk" in the restored pharmacy where Brad's drink later renamed Pepsi-Cola was invented. It's such a great downtown, Barb reflects from behind the old-fashioned soda fountain as tourist wander in and out. It will be New Bern's 300th anniversary in 2010, and a great effort is being made to highlight the city with updated structures and streets. Dave, who occasionally drops by the soda fountain for refreshments, is usually busy doing his volunteer work with habitat for humanity and the chamber of commerce. Steeple bells from half a dozen historic churches announce the hour, and patrons fill friendly restaurants and shops aptly named Middle Street, which bisects downtown. Judy, a former bank executive in Sarasota, also works part time downtown New Bern as a loan-servicing agent with the Neuse River Development Authority, a non-profit lending organization. "There are art galleries and a civic center and so much theater talent for a small town. Costumed characters in Colonial garb work the streets greeting people," Judy says. Originally from Maryland, the Bowdle's are "halfbacks" who decided to move halfway back north to retire in New Bern's four-season ambience. They wanted something near the water, and their 3 bedroom home in New Bern's upscale Greenbrier neighborhood is 10 minutes from their 20 foot boat at a small marina on the Neuse River. Golf is another pastime, and during their breaks from their "jobettes," they enjoy the nearby Emerald Golf Course, where their initiation fee is $900 and monthly dues are $188 for full golf membership. We hope you have enjoyed this webpage. Please call, 252 514 9157, or email, stevetyson55@gmail.com	if we can be of assistance in any way.